Nurture your soil! 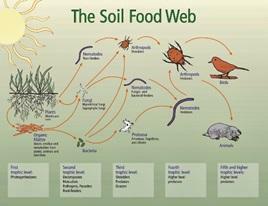 Soil is the foundation of life! The soil universe is incredibly complex, and we are only beginning to scratch the surface of our understanding of this universe! The compost you make from your kitchen and yard waste will feed the soil in your garden naturally. Did you know there are more microbes in one teaspoon of soil than there are people on the earth? Compost is a natural slow-release fertilizer. As it slowly breaks down in your soil, it releases nutrients that feed your plants as well as the beneficial microorganisms that support good plant growth. These beneficial organisms break down the minerals and other nutrients in compost and make it available to the plant roots through vast systems of micorrhyral fungi threads that attach themselves to the roots. 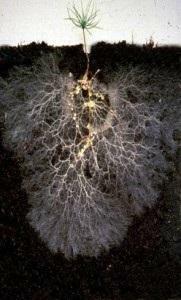 You can often see these white thread-like organisms if you dig in your garden….if the soil is healthy. Unfortunately, pesticides and herbicides will kill off these organisms, making it more difficult for your plants to take up the nutrients they need. To increase the soil’s ability to retain moisture, it is important to cover it with a 3” – 4” layer of mulch. Because this mulch breaks down into compost and becomes food for your soil, it should be replaced every year or two. This will permit you to feed your soil as well as retain moisture and reduce the number of weeds in your garden. Just remember to keep the mulch at least 3” away from the trunk or stem of your plants to avoid the possibility of rot caused by the mulch’s ability to retain moisture. By using compost and mulch to increase your soils fertility, we can eliminate the need for synthetic fertilizers. And these natural compounds do a much better job than the synthetic ones because they provide all the nutrients a plant needs in a form the plant can absorb and in the right amounts.